Web 2.0 in Belgium | Big things can come from small countries. Encouraging to see them focusing on the main business priorities. Big things can come from small countries, and so can ‘big’ people. for the rest of the country. When he left in ’99, he co-founded Eazel and was actively involved in the creation of the GNOME Foundation. In March 2001, Bart moved to Korea and worked as VP Business Development for Linux One and Hancom Linux. He later headed marketing and business affairs for the Mozilla Foundation, where he was responsible for the Firefox launch and business partnerships with Google and others. He went on to co-found Flock, for which he served as CEO until he stepped down in September 2006. Full bio can be found here. I got the chance to ask Bart a couple of questions, you can find the transcript of the interview after the jump. Mostly thanks to the growing information overload, web-based memetrackers are popping up like mushrooms. Memetrackers scan a limited number of ‘authorative’ websites and blogs for the latest and biggest news and discussions, often within a defined topic (e.g. politics, technology, etc.). Since most memetrackers are available only in English, the space for services copying the concept to aggregate sources in other languages is wide open. BlogObs (short for ‘Blogs & Observatory’) is leading the way for the French speaking community. BlogObs is a project by Denis Balencourt and Tor Holden (Synapsys), two guys from Brussels who have been friends since their childhood. They experienced the need of a memetracker for French websites and blogs, because they lacked the time it took to weed trough hundreds of RSS feeds in order to satisfy their lust for information. Since nobody seemed to be dedicating himself to create it, they decided to build one themselves (in association with DSImprove). Although the service was launched almost 2 months ago, it’s still running in ‘alpha mode’, which means imperfections can occur. Currently, BlogObs tracks an undisclosed number of French speaking websites and blogs for two well-defined categories: politics and technology (both can be syndicated with an RSS feed). If you want to keep track of future developments, check out their blog. Plans for the future include: adding video integration, more categories (e.g. science, media, …), other languages (Dutch should follow in the next couple of months) and to provide space for advertising so they can monetize traffic in a non-obtrusive way. In Belgium, there are two comparable services aggregating the Flemish blogosphere: blogium and De Blogoloog. Mobiya, a Belgian startup I briefly profiled last month, has just successfully closed a financing round. In total, a capital injection of a quarter million euro has been approved by an international group of private investors, among which a number of venture partners from Belgian and Dutch venture firms like Big Bang Ventures and Solid Ventures. Mobiya is exploring the fields of ‘Next Generation Classified Advertising’, by which they basically mean they’re actively looking for innovative ways of bringing classifieds from the offline and online world to the mobile phone. The Mobiya Application Suite, launched in October 2006, offers any publisher the opportunity to integrate classifieds in their magazines, newspapers and/or websites, handle the content billing, formatting, distribution, etc. The system is patent-pending; an approval is expected within the following 6 months. The company believes the explosion of mobile user generated content (text, image, audio, video, etc.) and the rise of mobile advertising are capable of disrupting the business model of traditional classified advertising (and estimated 100 billion dollar industry). The Mobile Classifieds industry is believed to grow into a 4.2 billion dollar industry by 2010. Below is Mobiya’s projection of the ‘Mobile 2.0’ roadmap, in comparison with the Web 2.0 (r)evolution. In my opinion, the projection is relatively cautious in terms of timing. I think we’ll be seeing a breakthrough in mobile payments and mobile social networks before 2010. Mobiya’s go-to-market strategy is twofold: indirectly (mobile enablement of publishers’ classified content and activation of user generated content initiatives) and directly (by working with partners on large-scale projects to provide full outsourcing of existing or new classified business). Mobiya is actively looking for media partners looking to create a full-scale classified gateway, and has already struck deals with national daily newspapers and classified advertising giants in both Belgium and the UK (where they have installed a sales office). A working example can be found on Dolcevia.com (check the sidebar on the left) and Mobiya.be. Comparable international services are emerging in this growth market as well: examples include IQZone and TextAndSell. Mark Creeten is very much into CSS & XHTML design, and his website Gigadesign.be has become a reference for a lot of professional web designers and developers. After receiving many requests from visitors, Mark came up with the idea of creating CSSSnippets, what he calls an ‘online CSS Code Social Bookmarking Tool’. Basically, CSSSnippets allows registered users to submit, tag, share and comment on CSS code snippets publicly or within a defined group of ‘friends’. The stats show that the usage is relatively low with 23 registered users having submitted 60 snippets, but Mark claims this is a result of the fact that CSS design is still relatively young in both Belgium and The Netherlands (the website is only available in Dutch). Nevertheless, the website has managed to make it to the 6th place in the category ‘best newcomer’ of The Dutch Web 2.0 Awards 2006. Mark is looking for ways to increase community participation by motivate users and visitors to submit their own CSS code snippets. If you have any suggestions, you can post them in comments. By the way, if you want to test your own CSS and XHTML skills, check out his other site Gigastyle.be. He’s 28 years old and he looks like an average college student. But don’t let that first impression fool you: Dries Buytaert is far from average. Currently a PhD student at the University of Ghent, and not even in his thirties yet, Dries has already managed to build up an impressive resume, which you can consult on his personal website. Most people know him as the founder and maintainer of Drupal, a brilliantly written piece of open source software, used by thousands of high-end developers worldwide to build content management systems, blogs, forums, collaborative authoring environments, etc. He’s the driving force behind the enthusiastic Drupal community (including the Belgian one), and an experienced speaker at international conferences. If you want to know how it all started, it’s right after the jump. 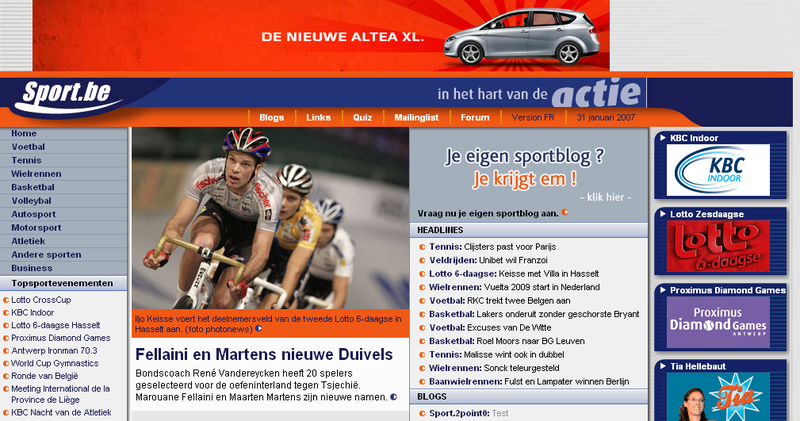 Sport.be, Belgium’s most famous sports portal, recently launched a free blogging service for registered users. It’s the first time a blogging service based on Six Apart‘s Movable Type platform is deployed in Belgium on this scale. The sports website was started almost 5 years ago, with the merger of the teams behind Sport24 (the ex-Planet Internet Belgium website became obsolete when the company was sold to Scarlet) and Belgiumsoccer.com. It operates from Paal (Limburg) and reaches an average of 60 000 unique visitors per day, with a total daily pageview count of 700 000. The company behind the website (Sport.be NV) is backed by a sole investor: Bob Verbeeck, CEO of sports marketing house Octagon. Gert Van Goolen, General Manager of Sport.be NV, says the blogging service will help them retain their readership by building an online sports fan community. At this moment, the service is only available in Dutch. The French counterpart is expected to go live in 2 weeks, and the company’s dedicated to roll out other services that involve participation from the community alongside. If you’re curious to know what they have in store, keep watching this blog for updates on further developments! Bart Claeys, who is also the founder of BarClaey, and Antwerp-based design and development company, has recently celebrated CreativeSkills’ first birthday. CreativeSkills is a portfolio website for the Flemish creative community, ranging from product developers, engineers, architects, web designers, 3D modellers, interior & furniture designers, and so on. The website allows registered users to showcase their portfolio, trainings and software skills. It also features a job board for the creative industry, which seems to be updated regularly (there have already been 12 15 positions added in Jannuary 2007 alone). There’s an RSS feed available offering updates for both new job offerings and new users. Registered users can be searched via a large designer tag cloud, and Bart Claeys has also put his Google Maps knowledge (one of his previous experiments is a map of all Belgian train stations) to good use by offering both a CreativeMap as a JobMap. CreativeSkills has already gathered over 1 300 profiles in 1 year. The website generates revenue trough Google Ads, E-mail sponsoring and some display advertising; addings open positions to the job board is free of charge. Personally, I think the site lacks a search engine where you can search names, education and software skills from users. Other stuff that comes to mind: individual RSS feeds per user so you can receive updates to specific portfolios, more personalization of user profiles, a flash video upload tool, a slideshow feature of portfolio images, more community features (like the ability to add friends to a network, sending public and private messages, allowing comments on other users portfolios, etc.). UPDATE: Bart checked in to remind me of the fact that CreativeSkills is still in Beta, but that there are several new functionalities and tweaks in the pipeline already. Furthermore, the networking, video uploading (example) and messaging features have already been added. CreativeSkills also has a blog.